The International Index to Black Periodicals Full Text is the only comprehensive current and retrospective index with full text to scholarly and other important periodical literature in Black Studies. 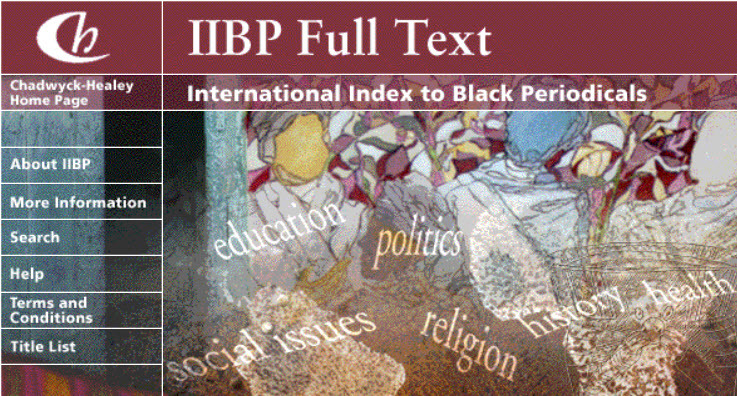 International Index to Black Periodicals Full Text covers a wide array of humanities-related disciplines including art, cultural criticism, economics, education, health, history, language, literature, law, philosophy, politics, religion, and sociology. Analyses of African-American literature; reviews of calypso music; features on civil rights, education policy, and politics in a range of African nations are just a few topics that researchers can explore. Coverage is international in scope and multidisciplinary, spanning cultural, economic, historical, religious, social, and political issues of vital importance to the Black Studies discipline.